If you want to stand a chance at ever being big enough, then you need high caliber ammunition! 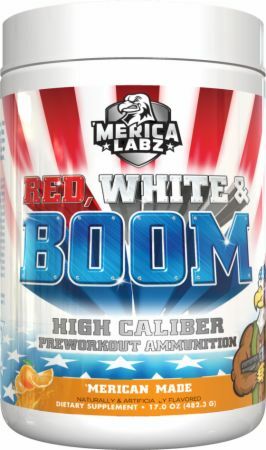 That’s exactly what we have packed into this great American preworkout that we like to call Red, White & BOOM! This straight to the point pre-workout is locked and loaded with everything that you need to leave your blood and sweat on the gym floor while you leave the weights raining tears. We may be a little over the top, and so are our products, but we are ‘Merican and proud of it! With fully transparent nutrition labels, full efficacious dosing, and produced in the highest quality facilities, we are just as proud of our products. Directions For Red, White, and BOOM: Mix 1 scoop with 10-16 ounces of water and consume approximately 15-30 minutes prior to your workout. 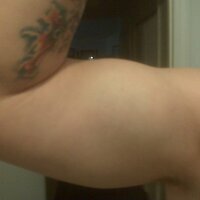 To assess tolerance, new users may want to start with 1/2 scoop. Warnings: This product is only intended for use in healthy adults 18 years of age or older. Pregnant or nursing women should not use this product. Consult your healthcare provider before useing this product, especially if you are taking any prescription, over the counter medication, dietary supplement product, or if you have any pre-existing medical condition including but not limited to: high or low blood pressure, cardiac arrhythmia, stroke, heart, liver, kidney or thyroid disease, seizure disorder, psychiatric disease, diabetes, difficulty urinating due to prostate enlargement or if you are taking a MAOI (Monoamine Oxidase Inhibitor) or any other medication. Discontinue use and consult your health care professional if you experience adverse reaction to this product. Do not exceed recommended serving. Do not use in combination with caffeine or any stimulants, including but not limited to, coffee, tea, soda, and other dietary supplements or medications. Do not use under extreme conditions of heat, sleep deprivation, extreme cardiovascular exertion or dehydration. Do not combine with alcohol. Do not use if safety seal is broken or missing. Keep out of reach of children.